Blizzard Frozen Drinks, an Australian Owned company, is a proud supporter of the Australian Made Campaign. We are committed to promoting responsible workplace health and safety practices, package recycling and the protection of our environment. The Blizzard range of products are manufactured locally under strict guidelines and formulas developed by Blizzard Frozen Drinks to meet the criteria set by Australian school canteen organisations. Blizzard Frozen Drinks proudly source all ingredients and packaging from Australian companies. The all natural Blizzard FRUITZ flavour range was initially developed for school canteens after consultation with the Healthy Kids Association (previously the NSW School Canteen Association). After considerable research conducted with students, parents and canteen managers (both primary and secondary schools), we set strict guidelines on product development. It was decided to produce a truly natural Australian product. That is, natural colours and natural flavours. We wanted to differentiate ourselves from the existing products in the market. These products were mostly manufactured overseas, with artificial colours and artificial flavours. Our research showed the consistency of the products were less than desired and the majority of students purchased a "slush" product by colour. Following six months of intense product development, our new and natural product range was ready to be taste tested by a range of school students. The results were very encouraging with the taste and product consistency reported at the higher end of the scale. The Blizzard FRUITZ fruity flavours are achieved by sourcing only the finest natural ingredients from Australian growers. The syrup concentrates are blended and packed to the highest Australian standards. The Blizzard FRUITZ flavour range has been registered with the Healthy Kids Association (AMBER when served in a 250ml cup). The dispenser is supplied, delivered and installed at no cost* (*Conditions Apply). Blizzard plastic mixing bottles are also provided “Free on Loan” to enable the finished product to be premixed and placed in the cool room for pre-cooling. Pre-cooled finished product enhances the fast freeze performance of the dispenser. Blizzard Frozen Drinks provide the school canteen with a selection of promotional posters to promote the Blizzard FRUITZ flavour range. Blizzard Frozen Drinks personnel are fully trained in the operation and maintenance of the Blizzard Twin Bowl Dispenser. A Service Hotline is provided to enable the operator to communicate any equipment/operational concerns. 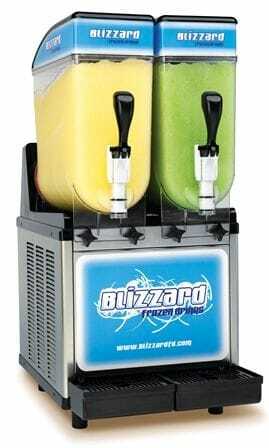 Blizzard Frozen Drinks guarantee to respond to concerns by telephone initially and if required, dispatch an experienced technician to the school canteen. Fruit Burst: Apple Juice Concentrate, Water, Food Acid (330), Natural Flavour, Natural Colour (150a), Vitamin C (300), Preservative (211, 223). Strawberry: Apple Juice Concentrate, Water, Food Acid (330), Natural Flavour, Natural Colour (120, 160b), Vitamin C (300), Preservative (211, 223). Orange Crush: Apple Juice Concentrate, Water, Natural Flavour, Natural Colour (160a), Vitamin C (300), Preservative (211, 223). Arctic Blue: Apple Juice Concentrate, Water, Natural Flavour, Colour (133), Vitamin C (300), Preservative (211, 223). Green Apple: Apple Juice Concentrate, Water, Natural Flavour, Colour (133, 102), Vitamin C (300), Preservative (211, 223). "Blizzard" and "Blizzard FRUITZ" are registered trademarks of The Blizzard Group.